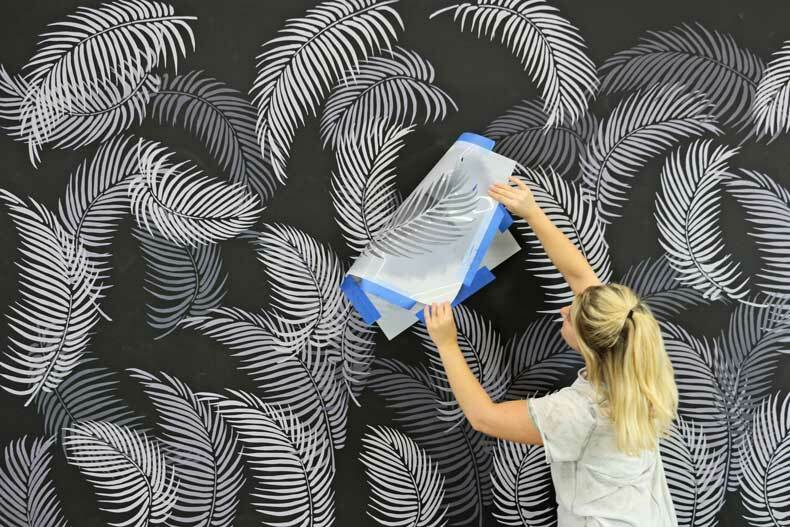 Get the look of expensive tropical wallpaper look for less with stencils by Cutting Edge Stencils. 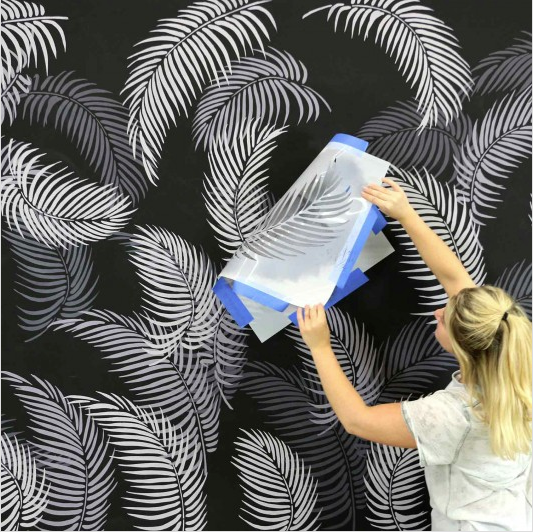 Dark tropical wallpaper has been flooding popular social media outlets like Pinterest, Instagram and famous interior designer blogs. Even companies like Anthropologie and Etsy have joined the bandwagon and started selling tropical wallpaper! 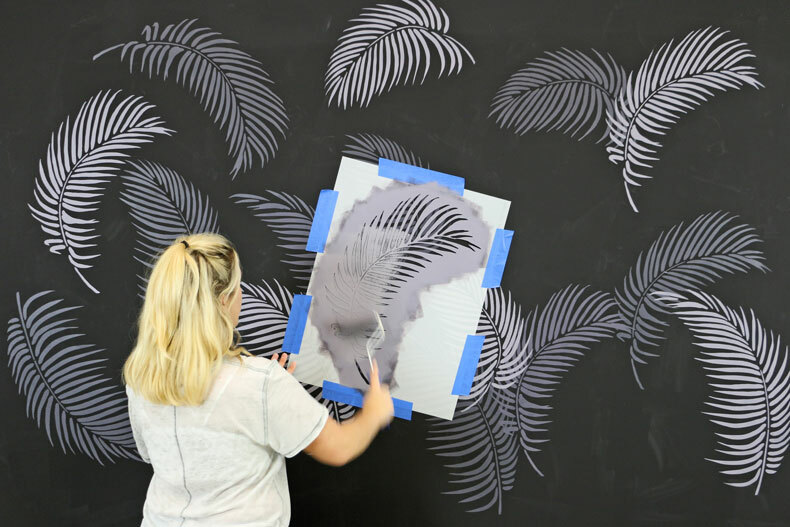 Trendy tropical wallpaper can easily be recreated the Palm Fronds 3-Piece Stencil Kit! 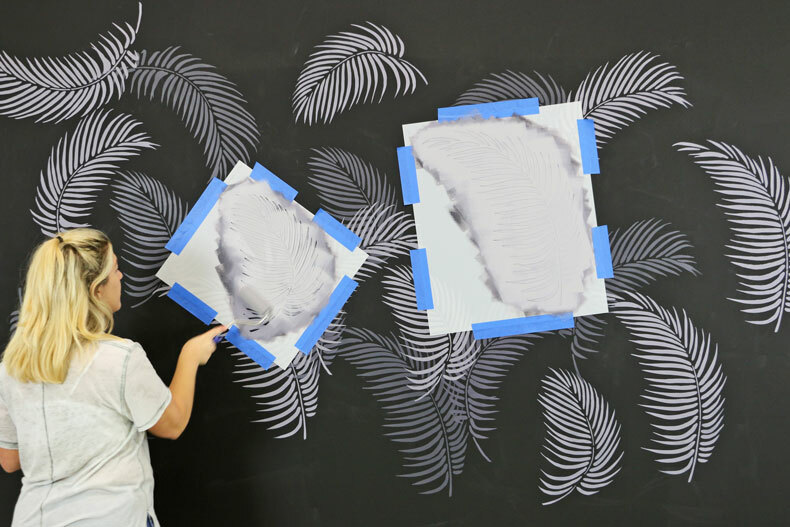 This large stencil kit is perfect for creating an amazing tropical wall pattern. Large palm leaves are a tropical trend that are easily produced with our beautiful leaf stencils. Wall pattern kits are super easy to use: just place the stencils by eye and create your own wall pattern without the hassle of registration and perfect alignment! No making a mistake here, what a great choice for stenciling beginners! So, start the staycations with our tropical stencil patterns, and don’t forget the Margaritas! Allover stenciling just got ridiculously easy and fun. No more stress! Our Wall Pattern Stencil Kits are designed in such a way that they can be placed by eye with no measuring or alignment necessary. 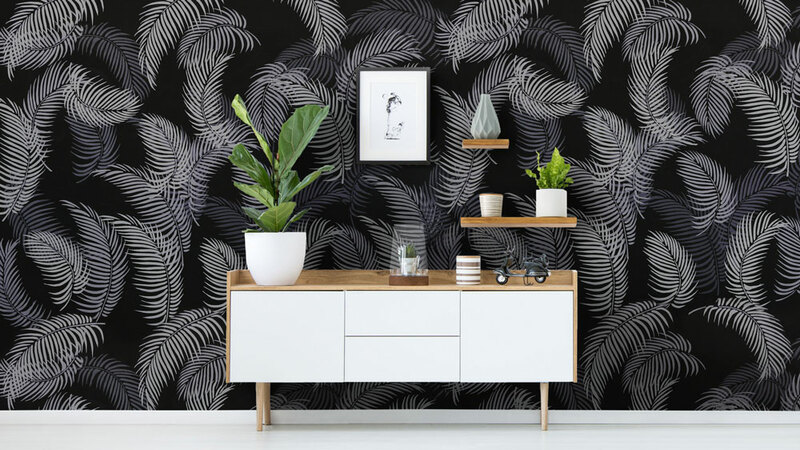 You will be amazed at how quickly you’ll be able to cover your walls with these gorgeous tropical leaf patterns and how little paint you’ll use. These stencils are a very cost effective alternative to designer wallpaper and you can say you painted it yourself! Fun, Easy and Inexpensive! Let’s get stenciling! We are using Behr’s “Script Ink” as our darkest palm frond leaf tone. 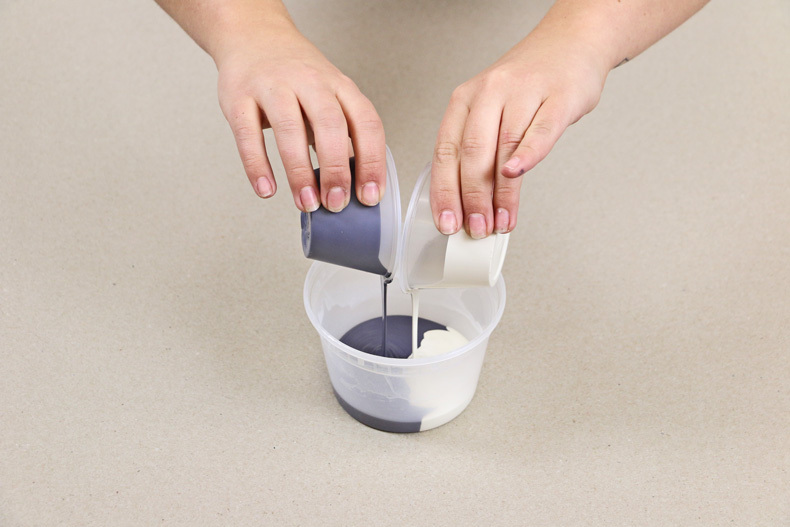 For your next lightest tone, pour both “Script Ink” and Navajo White by Benjamin Moore into a soup container. Mix thoroughly and create your medium tone. 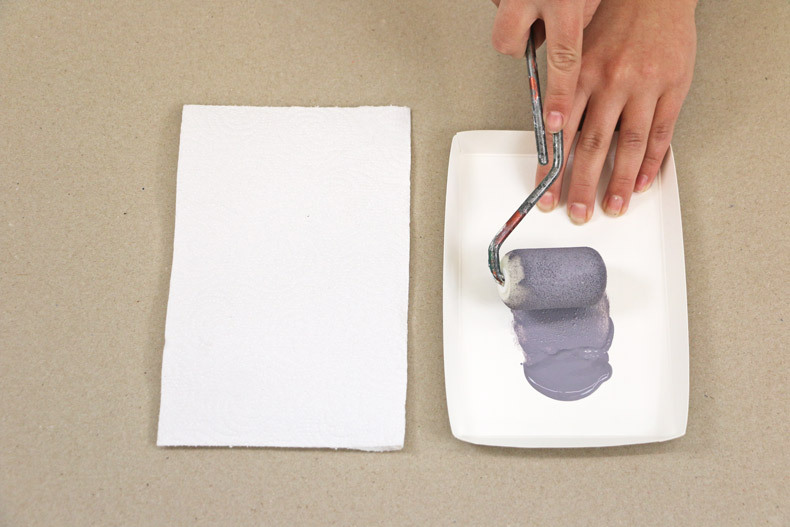 For your lightest tone, you will repeat the same process but with more white paint! 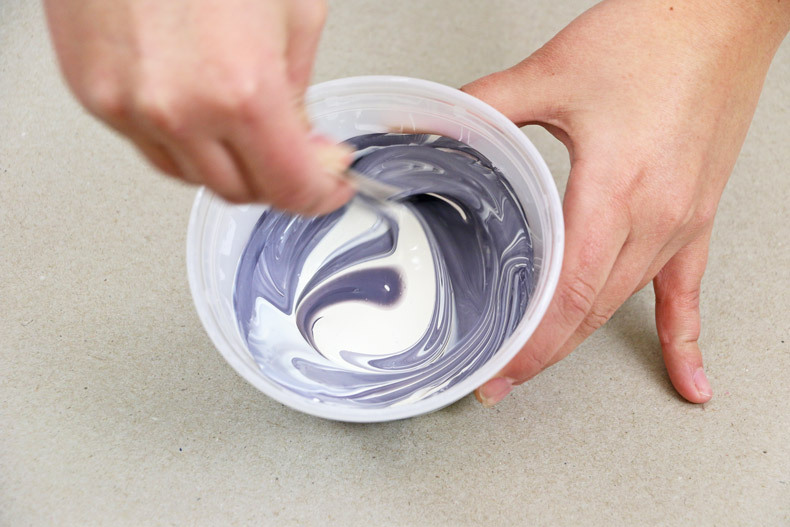 Pour some paint onto a tray and evenly load your dense foam roller with paint. 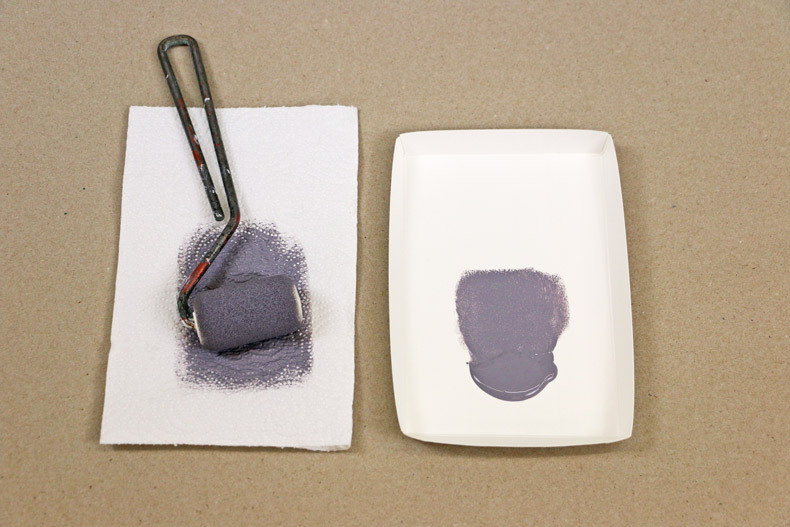 You don’t need a lot of paint on your roller so if you feel there is too much, offload excess paint onto a paper towel! Apply spray adhesive to the back of your stencil to reduce your chances of bleed. 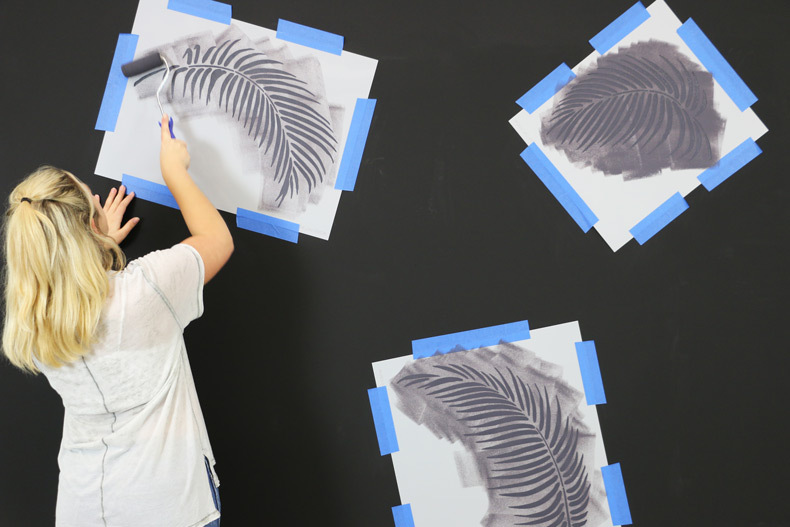 Randomly place your three palm fronds stencils on your wall then roll in your darkest color first! Make sure not to fill up the entire wall with dark palm fronds leaves. Leave some wall color showing! When you’re satisfied with the amount of dark leaves on your wall, move on to the next lightest color! We cannot get enough of how easy this accent wall was to create! These tropical stencils get the job done in just a few short hours! Stay on trend and also within your budget! What do you think?